Frank Henkel (born 16 November 1963) is a German politician. He is a member of the CDU party. Since 1 December 2011 he is a Mayor and Senator of the Interior and Sports of the German state of Berlin. From 2008 he was the opposition leader in the Abgeordnetenhaus, the state parliament of Berlin, in which he is a MP since 31 October 2001. In 2011 he led the CDU back into the government as the junior partner in an SPD-led coalition. Henkel was born and raised in East Berlin, and attended Polytechnic Secondary School. He began an apprenticeship after school, but in 1981 the family moved to West Berlin, after their request for departure was granted. In West Berlin he completed vocational training as a wholesale and foreign trade merchant in 1984 and worked for two years at the Friedrich Krupp AG. From 1986 to 1987 he attended technical secondary school and studied economic and social sciences at Berlin School of Economics and Law afterwards. In 1994 he graduated as a Diplom-Kaufmann (German business administration degree, similar to MBA). In addition, he graduated in public relations at German Academy for Public Relations in Frankfurt and in journalism at Free University Berlin. Since 1985 Henkel was a member of Junge Union, since 1986 of the CDU. Between 1987 and 2005 he held various political offices in the CDU. He also worked as a speaker in the executive staff of the district mayor of Reinickendorf, Berlin, from 1996 to 2001. In January 2001 he became office manager of Berlin mayor Eberhard Diepgen and in June 2001 office manager of the CDU faction leader in the Abgeordnetenhaus. In October 2001 he was elected MP in Berlin. 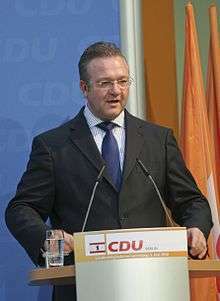 In May 2005 Henkel also was elected Secretary General of the Berlin CDU, in September 2008 opposition faction leader in the Abgeordnetenhaus and in November 2008 chairman of the state CDU. In 2011 Henkel became frontrunner in the 2011 Berlin state elections and led the CDU back into the state government. In March 2016 he was nominated again as the leading candidate of the CDU for the 2016 Berlin state elections. As one of Berlin's representatives at the Bundesrat, Henkel is a member of the Committee on Internal Affairs, the Defense Committee and the German delegation to the NATO Parliamentary Assembly. In the negotiations to form a Grand Coalition of the Christian Democrats (CDU together with the Bavarian CSU) and the SPD following the 2013 federal elections, Henkel was part of the CDU/CSU delegation in the working group on internal and legal affairs, led by Hans-Peter Friedrich and Thomas Oppermann. Henkel again led his party in the 2016 state elections. Ahead of the vote, he regularly polled behind his Social Democrat counterpart, incumbent Mayor Michael Müller. His party ended up falling from 23 per cent in 2011 to 17.6 per cent, its lowest result in Berlin. ↑ Dan Hough (September 21, 2016), Germany’s ruling party lost this week’s Berlin election. What does this mean for the 2017 national elections? Washington Post. ↑ Stefan Wagstyl (September 19, 2016), Rightwing AfD gains foothold in Berlin, but falls short of target Financial Times. ↑ Board of Trustees German Forum for Crime Prevention (DFK).